The familiar orange carrot was once an oddity. It is just a little more than four hundred years old. The purple carrot, originally domesticated in Afghanistan in 900 A.D., was dominant until the orange root was bred by Dutch gardeners in the 1600s. As surprising as this tale is, its uncovering is equally intriguing. Scouring paintings in the Louvre and other museums during the 1950s, an unsung Dutch agronomist made a stunning discovery about the change in the carrot’s color. By the seventeenth century, he observed, the orange carrot was becoming more prominent in the still life paintings of his homeland. The story of the carrot is just one of the hidden tales my book, The Carrot Purple and Other Curious Stories of the Food We Eat, recounts. Like the carrot, most of the foods we eat have reached us only after traveling a long, intricate path, with many twists and turns along the way. I explore how a wide range of ingredients, from artichokes to strawberries, were in different locations invested with new meaning. They acquired not only culinary significance but also ceremonial, medicinal, and economic importance. Foods were variously relished, revered, and reviled. I took many foods, common and unusual, for granted. Determined to overcome my complacency, I began the quest out of which this book was created. The carrot was one of my early subjects. When my wife, Peggy, urged me to dig into its story, I first resisted, wondering how such an ordinary vegetable could be of any interest. As I delved into its history, I was surprised to learn of the carrot’s beginnings as a purple root. When I shared my discovery with friends, they were also tantalized. I presented the results of my investigation to an annual meeting of the Oxford Symposium on Food and Cookery. The audience of historians, cooks, gardeners, and culinary amateurs reacted with enthusiasm. I was spurred to continue. It is easy to forget that commonplace foods were once mystifying. Fernandez de Oviedo, the sixteenth century Spanish traveler, groped for ways to describe the alien avocado. “In the center of a fruit is a seed like a peeled chestnut.” Its paste, he observed, was “similar to butter.” Since the avocado resembled a pear, the Spaniard recommended enjoying it with a pear. The tomato, a recent import to Italy from Spain, puzzled the Italian physician Pietro Andrea Mattioli. It is another “species of eggplant,” he reported. Foods were also surrounded by superstitions and taboos. The eggplant was viewed suspiciously from its earliest days. In Spain, it was not only viewed as a “semitic” food but also as a carrier of ills. Wherever the eggplant migrated, feelings of dread followed. The Moors in Spain, the story went, planted the poisonous vegetable in order to kill Christians. In Italy, where it was transported by Arab traders, the eggplant was called melanzane, from the Latin mala insana, or mad apple. A host of maladies were imputed to it. Castore Durante, the sixteenth century physician, blamed melancholy, cancer, leprosy, and headaches on eating eggplant. Even in the Middle East, where it would be passionately embraced, it was originally disdained. In his book on poisons, Ibn Washiya, an Arab toxicologist, declared the raw vegetable poisonous. “Its color is like the scorpion’s belly and its taste is like the scorpion’s sting,” according to an eleventh century Bedouin saying, cited by food scholar Charles Perry. Conversely, foods, especially those invested with sacred symbolism, could also inspire wonder and awe. In ritual, ceremony, and primal rites, they gave a larger meaning to life. The crimson pomegranate was a symbol of holiness, fertility, and abundance. Both the Jews and the early Christians were devoted to the fruit. Renaissance painters who linked the pomegranate to the Christ child made it a religious motif. Just as food plants could be sacramental, they could also be denounced by the religious establishment. Coffee, which had become a popular drink in the Islamic coffeehouses, threatened clerics. Fearful that these new venues would lure their flocks away from the mosque, the imams tried to stamp them out. Even in Christian Europe, coffee was greeted warily. Catholic priests attacked the “hellish black brew,” a drink they considered only fit for Muslims. They failed to persuade Pope Clement VII, who, in the early 1600s rejected their entreaties: “We shall cheat Satan by baptizing it,” he declared. Food was also the raw material for myths and legends. Treasured by many as an auspicious fruit, the pomegranate took on darker tones in Greek myth. The goddess Persephone, who was spirited away to the underworld by Hades, the lord of the lower depths, was tempted to eat a “honey sweet” pomegranate seed. As a consequence, she was condemned to stay underground during the winter months and only ascend to earth in the spring. Food played another important role, as a symbol of social distinction. The wealthy, for example, ostentatiously displayed exotic fruits as signs of status. The regal pineapple was a centerpiece at dinner tables on English estates and depicted on Wedgewood china, sugar bowls, and teapots. The gentry grew luxurious pineapples in “pineries” (hot houses) during the cold months. Similarly, French royals prominently housed evergreen trees bearing oranges in fancy enclosures called orangeries. Other transplants sustained masses of people and met their nutritional needs. The peanut, a Latin American native carried to West Africa by the Portuguese, filled a major gap in the diet. Converted into spicy soups or stews, it provided critical protein. In the modern era, ingenious marketing was often required to persuade shoppers to try novel foods. The banana, which some feared would upset their stomachs, was such an item. United Fruit experimented in its test kitchens, searching for a breakfast dish that the banana could accompany. Cornflakes with milk and bananas was the company’s candidate. Cereal boxes in the 1920s contained coupons offering free bananas. Broccoli, which once had a predominantly ethnic market among Italians, was transformed into a national brand by the D’Arrigo Brothers Company. The company advertised the vegetable on the radio and labeled it “Andy Boy,” after the son of one of the company’s founders. The new brand had a dramatic impact on the mother of Charles S. Vizzini, a friend of mine. “It’s not broccoli. It’s Andy Boy,” she enthused. The odyssey of foods will doubtless continue. There are more hurdles for even the oldest of foods to surmount. When will we be as conversant with the ancient fig as we are now with the once-unfamiliar pomegranate? 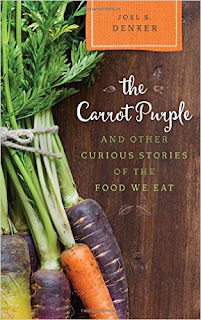 Adapted from the Introduction to The Carrot Purple and Other Curious Stories of the Food We Eat, available from Rowman & Littlefield (or 1-800-243-0495) or through Amazon.com and other online vendors. The contents of this post are Copyright Joel S. Denker, 2015.